How to fix a Samsung French door refrigerator mullion flap spring by installing a new spring and pin. I have a 4 year old Samsung French door refrigerator model RF268ABRS. The left door wouldn’t close because the center mullion flap wouldn’t retract and hit the right door. I found a small broken spring on the kitchen floor and realized it fell off the door flap causing the problem. The lower end of the spring is inserted into the door hinge with my fingers. No tools are needed. The spring repair is complete. I’m surprised that a refrigerator with a nearly $2,500.00 price tag has poorly designed parts that can’t handle a longer duty cycle. It seems it was designed to fail. Samsung and LG are both Korean manufacturers that share the same door flap design with an exposed easy to replace spring. LG refrigerators are sometimes rebranded as Kenmore with the same problem.
. The product photo on Amazon is upside down and the guide can be seen at the bottom of picture. Your repair of the french door mullion is great..but my spring is hidden somewhere on the Samsung 2 door french. Any ideas where or how to get at to replace. Spring does not show at all. Go to Appliance Parts Pros (see the link in the article) and enter your refrigerator model #. The parts diagram will be displayed. Examine the door parts to locate the mullion spring. That should tell you how what to take apart to get at it. Spot on advice. Thank you! Temporarily, I replaced the broken spring with a clothing pin spring. I twisted the “L” part to face upward instead of downward. It is not a good replacement, but it works until the new spring will arrive. Thank you! A cheap fix for a cheapo design. It’s a good, quiet, unit but something that takes that much punishment should not depend upon a pin with the toughness of a toothpick. While replacing the spring in my Kenmore Elite mullion, the wires to the connector broke up inside the mullion. I cannot find a way to disassemble the mullion so that I can splice the wires. What do the wires go to? Is there some sort of heater inside the mullion? The mullion assembly is quite expensive.Can it be disassembled? What is the risk of not replacing the mullion? AppliancePartsPros.com will have part diagrams and often instructions. It should give you an idea of how to disassemble the mullion then you can assess if it’s possible to repair the wires. Left door won’t close. Appears to be mullion door spring. How to remove mullion/cover to see spring? Removing center hinge screws is no help. Parts is no help for this model. Can’t find mullion or spring in Appliance Parts Pros. Is there a video for this model? I also couldn’t find much in the way of parts for the RF23HCEDTSR at Appliance Parts Pros and other parts websites. The Samsung French Door Refrigerator Won’t Close – Mullion Fix / Repair YouTube video may be helpful as the mullion is very similar between different models. Try calling Appliance Parts Pros at 1-877-477-7278 to see if they can find the part you need. Thanks So much! So happy to have stumbled on your page. Problem fixed. Thanks for this. I’m in Canada and Reliable Parts had the replacement parts. Problem is fixed. Thank you so much. You saved me a lot of time. I have a similar refrigerator (rfg298aars) and it used the same parts you uses. Spring and pin was easy to replace and it is fixed. What is not so easy to fix is my opinion on an expensive refrigerator where a single spring screws the door up. Further, my patience is running thin with this refrigerator. It’s 6 years old, still looks great and performance is great but it’s falling apart inside. I’ve had to replace several of the plastic guards on the doors, the sliding bins barely work, the retractable window door on a bin is broken and Iremoved completely. The freezer bins barely slide. I just haven’t wanted to gut the inside and spend a lot more money just to fix what should be better quality in my opinion. Anyway enough of my vent, thank you very much for a very good detailed solution. I have a RFG297HDRS (French Door Samsung) and have a problem with the mullion flap. However, it’s not the spring. The flap is BELOW the track (as you have it labelled above) and so the mullion won’t close when I close the door. It’s like something is missing from the top of the mullion but it looks SO similar to all the mullions here, just too short. Just bought the house with these two-year old appliances. I looked up your refrigerator model number and looks nearly identical to mine. I believe the mullion/flipper guide that engages the track in the refrigerator has broken off. See the “Broken Door Mullion/Flipper Top Guide” update at the end of the article. Let me know if it’s the correct fix. Thank you for this easy-to-follow step-by-step guide. The spring broke on my refrigerator last night and I wasn’t sure how I would get it repaired. This certainly looks do-able for a novice and I’ll be shopping for parts this weekend. Thanks again! Worked like a charm. Just be careful which side of spring goes where. I initially flipped it the wrong way and it didnt work. Once i flipped it around, no issues but was worried it may break. It is also not easy to push it in with fingers, but with some patience it worked. Longer side of spring goes up with pin, shorter in door hinge. Hope this helps, not obvious in pic above. Great instructions! I have the RFG237AARS model. You are slightly incorrect with regard to the mullion guide. Part of the guide is molded into the case but the screw on my model holds what looks like a nylon extension. It is the extension that engages the track guide on the refrigerator door and will likely break. If it does break even the guide on a new case is not long enough to engage the track guide. can’t find anything on any of the parts sites that even reference the nylon guide piece. You have to buy the whole mullion, heater and all to get this one tiny plastic curved piece. I bought a replacement spring and installed it but the flap is still stuck open. What else could the problem be? What happens when you open the door and close the flapper by hand; does the spring hold the flapper closed? What is the make & model of your refrigerator? Hey Bob, Great detailed advice. I loved it. I see your commitment too in helping others as you provided update to your post for another user with RFG297HDRS. I have the same model # RFG297HDRS/XAA and the mullion spring and the white little cylinder are broken. I have looked enough on the net already but can’t figure out the part # for the spring and white cap. Would you please let me know the part numbers? Thanks in advance. 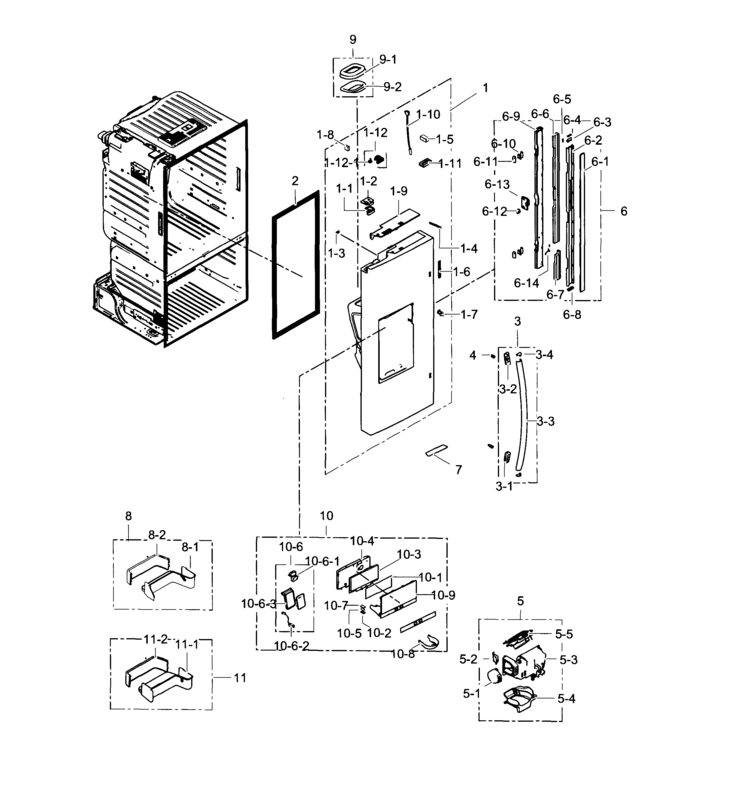 The Repair Clinic has the part: Samsung Refrigerator Spring DA81-01345B. Thank you very much. Parts ordered. Will post once I fix the door. Regarding the top nylon guide in the mullion : my model is RF260BEAESG..no top screws and does not engage when closing the fridge. Should I replace the entire Mullion? Check the RF260BEAESR/AA-0001 parts diagram to see how the mullion is assembled. Then you’ll know if the entire mullion needs to be replaced. I think the sixth and seventh photos above are misleading. I did exactly this replacement, and the spring held the flap out rather than against the door — exactly the opposite of what it’s supposed to do — until I flipped it around and put the end with the extra flat section against the main door. On my door the spring can only be installed as shown to correctly operate the flap, and sit inside the flap pocket when the door is open (flap held against the door). Glad you got yours working! This is fantastic! Thank you for sharing your information! I will follow through this weekend and let you know how it goes!! Blessings!